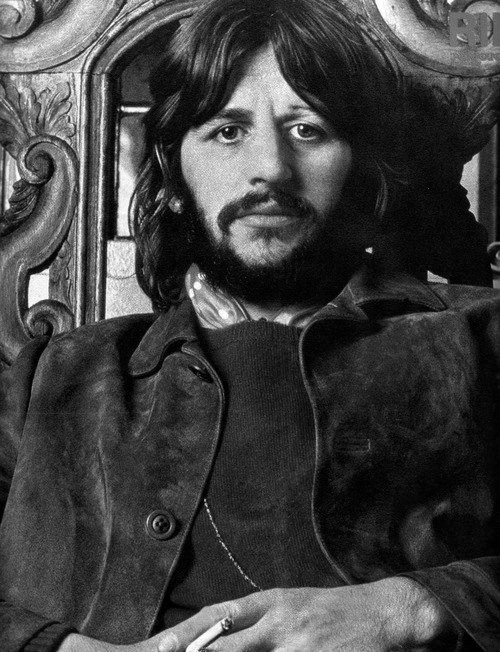 There are still people in this world – people without functioning ears, I assume – who labour under the misapprehension that Ringo Starr wasn’t a good drummer. Lennon’s joke in an interview that Ringo wasn’t even the best drummer in the Beatles hasn’t helped his reputation amongst non-musicians (and people who don’t understand irony), but even though Lennon’s humour could be cruel, this wasn’t what he intended when he made the crack, I’m sure – after all, who is the drummer on John Lennon/Plastic Ono Band? The former Beatles were prize catches for any session player in the early 1970s and as much as Lennon obviously respected and trusted Ringo’s musicianship, it was only natural that after 10 years with the same guys, the ex-Beatles would look to cast their nets a little wider when making their own albums, play with other people, see what others could contribute to their songs. Such was their colossal reputations, to get a nod from a Beatle and get to play on a song would establish the musician’s own rep among his peers. Alan White was not a ‘name’ when he played on Instant Karma but, impressed by him, soon Lennon introduced him to George Harrison and so White was added to the pool of drummers who appear on All Things Must Pass, along with Jim Gordon, former Delaney & Bonnie sideman, and a member of the nascent Derek & the Dominoes at the time of the All Things Must Pass sessions. Added to this short and august list is Ringo Starr. Playing Guess the Drummer is one of the greatest pleasures of Harrison’s solo debut. You often need acute ears to tell the three apart, which speaks to the adaptability of the trio, their ability to inhabit the music, to put themselves at the music’s service. At a brisker tempo (say, on Wah-Wah), Ringo’s playing starts to feel more identifiably Ringo-esque, but on Beware of Darkness, you could be listening to Jim Keltner, to Russ Kunkel, or to anyone else who built their career in the seventies on being able to play slow four-four grooves that swing rather than plod. There is so much more to Ringo Starr than splashy open hi-hats and backwards fills. Listen to Beware of Darkness. Listen to Ringo’s groove, the spaces he leaves for the music to breathe, listen to fills he plays, the emotional responses he’s having to the song when he plays them. You’re listening to the most important drummer in popular music. Those who know me best know I’m not averse to a little bit of cheese in a good ballad. For many people, Careless Whisper goes too far. Maybe it’s the lyrics, maybe the saxophone riff, maybe George’s Princess Diana hair in the video, but it’s too much for them. For me, though, it’s fine. More than fine. It’s one of the best records of its type. A key reason why is the drum track, played by Trevor Morrell, who was one of George Michael’s go-to guys in the Wham! days. Morrell is a very steady timekeeper with a good feel and who (according to the Posies Ken Stringfellow, who a few years ago chanced upon him while producing a record in Spain and ended up bringing him into the session) gives the drums a surprisingly hard battering. There’s a lot to learn about the success of Careless Whisper as a recording by listening to the Jerry Wexler-produced version, which was shelved by an unhappy Michael but eventually released as a B-side. Jerry Wexler producing a soulful ballad by a great singer in Muscle Shoals – this had been a recipe for success for 30 years before Careless Whisper, yet when you listen to the two versions, it’s clear why Michael nixed the first one and chose to start again, producing it himself. Small difference in terms of what is played, huge difference in terms of how it feels. Another simple decision, to have 16th notes on the hi-hat rather than 8th, thus giving the song a greater sense of internal propulsion, was the other factor that made the drum track, and hence made the record. I’m not sure whether they were doubled on a drum machine for the second version, as a hi-hat pulse is present under the opening fill (which would require more hands I imagine Morrell has), but the difference the double-time hats make is plain. Morrell pushes Careless Whisper along while never forcing things, never stepping on Michael’s turf (or the saxophonist’s). Some of his fills, too, are inspired – I really like the big floor tom-and-snare build-up Morrell plays at around 4.35 as he goes out of the tricksy groove with displaced snare strokes back to the main groove. My guess is that he was having a bit of fun, assuming the track (or at least the radio mix) would have faded out already but his off-the-cuff fills felt so good that Michael decided to keep the whole thing for the unedited version. Good decision, George. This entry was posted in Music and tagged Alan White, All Things Must Pass, Careless Whisper, Delaney & Bonnie, Derek & the Dominoes, drummers, drummers who can drum/singers who can sing, George Harrison, George Michael, Jerry Wexler, Jim Gordon, Jim Keltner, John Lennon, Ken Stringfellow, Muscle Shoals, Plastic Ono Band, Ringo Starr, Russ Kunkel, The Beatles, Trevor Morrell, Wham! on November 7, 2013 by rossjpalmer.